There is always a party somewhere in Puerto Rico, but here are the island's biggest bashes. If you're in town for one of these, be prepared for long nights, loud music, and the general cacophony of people having a good time. In Puerto Rico, as in much of the Latin world, the Three Kings rule the Christmas season. Puerto Ricans celebrate December 25, but the most important day of the season falls on January 6. Known as El Día de los Tres Reyes Magos, or Three Kings Day, this island tradition calls for children to gather grass and place it in a box at the foot of their beds so that the camels of the Three Kings will have something to eat when they come to visit. While it is a revered holiday throughout Puerto Rico, nobody does Three Kings Day quite like the small, southern town of Juana Diaz, whose Three Kings tour the island before making the voyage home. Held in the third week of January, this festival is one enormous outdoor party, and one of the biggest celebrations in San Juan. San Sebastián Street in Old San Juan gets absolutely stuffed with stalls, crowds, food, alcohol, music, arts and crafts shows, and general revelry. This homage to the cellist Pablo Casals is widely considered to be the premier classical music event in the Caribbean. While Maestro Casals was not Puerto Rican, he moved to the island in 1957, organized the Puerto Rico Symphony Orchestra, and began this annual tribute to classical music. Over the years, it has drawn some of the biggest names in the industry to Puerto Rico. Held in the San Juan Performing Arts Center, the festival takes place over several weeks. Past Saborea! fests have brought chefs like Iron Chef Cat Cora, Anne Burrell, Claire Robinson, and Mr. Chocolate himself, Jacques Torres. During the week leading up to Ash Wednesday, Ponce celebrates Puerto Rico's version of Mardi Gras. The Ponce Carnival is the most celebrated and colorful festival on the island. It's also one of the oldest, dating back to the 1700s. 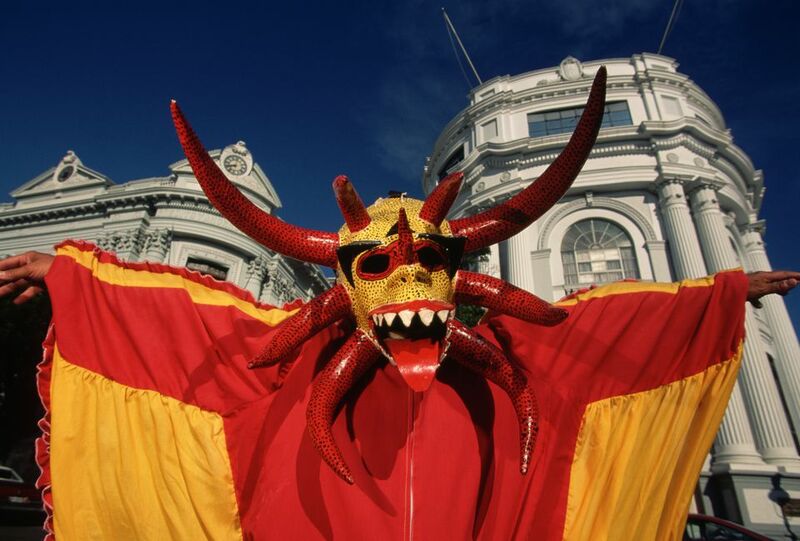 Locals and tourists alike descend on the island for the occasion, and the main draw are the vejigantes, which are costumed characters donning wildly vivid demon masks. It's a fun, raucous event marked by thumping bomba y plena music, massive crowds, and hordes of masked revelers. The festival concludes on the Tuesday before Ash Wednesday with the Entierro de la Sardina, or Burial of the Sardine. This is a nutty, mock funeral procession (complete with a dummy in a coffin) led by drag queens and fake mourners. Summer Kite Expressions is Puerto Rico's only Kiteboarding Camp for teenagers. Run by 15 Knots Kiteboarding, the camp introduces young people to the sport of kiteboarding. In addition to the sport, it focuses on interacting with nature in a responsible way, and of course, getting plenty of exercise. One of the Caribbean's biggest Jazzfests, this annual festival is a Jazz lover's dream. The open-air Tito Puente amphitheater in San Juan's Hato Rey district is the ideal venue, and the four-day concert brings together contemporary Jazz masters. The festival, held in late May-early June, was headlined by the legendary Arturo Sandoval. There are also jazz workshops for serious musicians. The Puerto Rico Salsa Congress is a weeklong celebration of everything in the world of Salsa. Held in June, it attracts local and international Salsaficionados, who come for the music, the dancers, and even to learn from seasoned instructors. Tickets and passes aren't cheap, so you better be serious about your art before signing up. The highlight of the event is the annual World Salsa Open, a no-holds-barred dance competition that would put Dancing With the Stars to shame in a heartbeat. Few game-fishing events in the Caribbean carry the clout of this annual tournament, held each August/September. The San Juan International draws deep-sea fishing anglers and game fishing enthusiasts from around the globe. It's a week-long tag-and-release competition known primarily for the abundance of blue marlin fishing during the day and parties at night. Held at the Club Náutico in Miramar, San Juan.